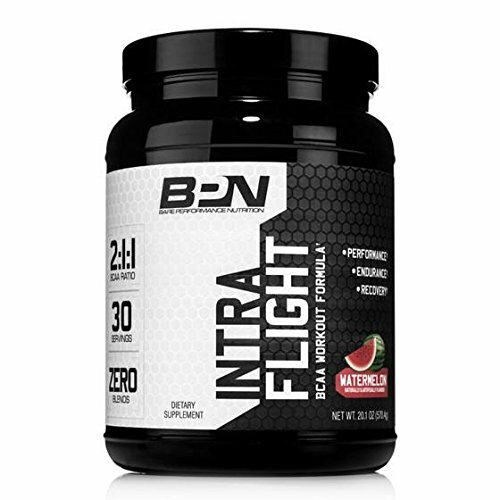 Intra Flight is a branch chain amino acid product that is intended to be used during training. It contains 8 grams of BCAA’s at the suggested 2:1:1 ratio. Like all Bare Performance Nutrition products, there are no proprietary blends that leave you guessing for the exact ingredient dosage. Intra Flight is more than an amino acid product. It includes ingredients shown to increase performance, recovery and fuel you through the toughest workouts. We have included Taurine, Citrulline Malate and Agmatine Sulfate to maximize blood flow to the muscles resulting in longer lasting pumps. Carnitine L-Tartrate was included to prolong your workouts and provide the recovery assets essential to keep you in the game. Once you try Intra Flight, your training will never be the same without it! BCAA, ENDURANCE, RECOVERY – INTRA FLIGHT was designed to fuel your muscles during intense training sessions with ingredients to increase natural energy, prolonged endurance and recovery. This product contains 8 grams of Branch Chain Amino Acids (BCAA). It is very effective when consumed during training, long cardio or throughout the day to promote faster recovery. TESTED: All of our ingredients are tested prior to entering our manufacturing facility and once again before the products ship out for distribution. We take pride in our ability to create and offer a safe, reliable and true whey protein source. GUARANTEED SATISFACTION: Bare Performance Nutrition stands behind our products 100%. If you are not satisfied with any of our products, we will help you resolve your concern and provide a full refund. BARE PERFORMANCE NUTRITION: Our company is located in the heart of Texas – Austin. We are veteran owned/operated and hold ourselves to the highest of standards. If you have any questions about our company or products, please feel free to reach out to us by email or social media. Our entire line is manufactured in the United States.